On September 28, 2005 there is going to be a tasting of New York State wines, from the Finger Lakes and Hudson Valley, to Long Island, and it's for a good cause. Some of the wineries include Bedell Cellars, Castllo di Borghese, Millbrook Vineyards, Rivendell, Standing Stone, and Swedish Hill among many others. 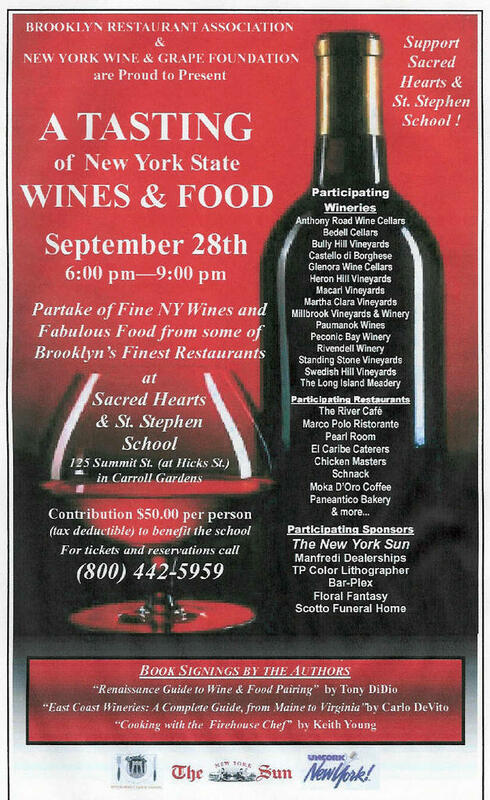 & NEW YORK WINE & GRAPE FOUNDATION, and being held at Sacred Hearts and St. Stephen's School, at 125 Summit Street (at Hicks Street) in Carroll Gardens, Brooklyn. 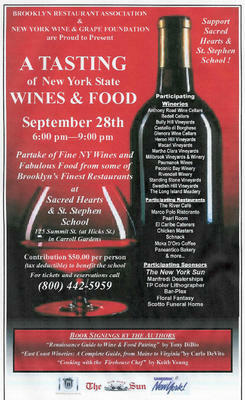 The cover charge is $50 to taste dozens of wines, and proceeds go to the school. Buy some tickets....call 1-800-442-5959. I'll be there signing my book, as well as Tony DiDio (author of Renaissance Guide to Wine and Food Pairing) and Firehouse Chef Keith Young (Cooking With the Firehouse Chef). It's for a good cause and the wines will be wonderful!!! So many poeple are so dedicated to the age old proverbs of fashion and food....whites get pulled out after Memorial Day and get put back the first tuesday after Labor Day. Even with the plethora of advisors who have extolled the virtues of ignoring such blather, people continue to do so. Don't follow convention. At the afore mentioned Hudson Valley Wine Festival (see previous entry) we drank many wines. And we discovered some great, inexpensive summer whites. These were fruity but dry inexpensive whites, that go great with salads, chicken, fish, grilled vegatables, pasta dishes. And you don't only have to drink them in summer. We discovered one new white we liked very much.... Ravines House White. Ravines is a Finger Lake winery, based on the east side of Keuka Lake, in Hammondsport, New York. The 2004 House White only cost $8.95. it is an off-dry blend of "Cayuga and Vignoles with vibrant fruit flavors of honeydew, pear and apple," according to the winery. It finsihed light and crisp and was delicious. We had a bottle on our deck with some fresh tomatoes, some cheese and a baguette. Excellent!!! 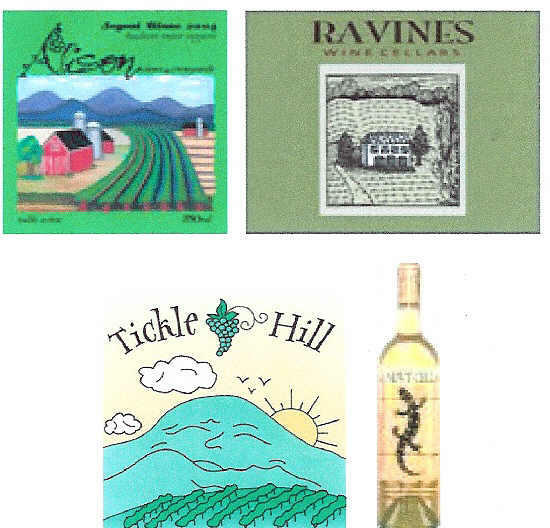 Another white we liked was Tickle Hill Cayuga White. The 2003 bottle goes for $8.95 and won Best of Class and Double Gold at the New York State Food & Wine Classic. It's grapfruit-y, with lots of good fruit up front on the nose and on the palette, but a fabulous dry finsih. The label is puckish and good natured, but what's inside is a a great, sophisticated pleasure. We also loved the Alison Seyval Blanc. Seyval Blanc 2004. Green apple and lemon, and a touch of honeysuckle, this is a stainless steel delight. A fabulous suprise. A wonderful mouthful of summer in a bottle. And it's a bargin at $12.95. These wines are great with all kinds of food. Don't relegate your "summer whites" to the back og your whine closet because the calander has turned. Show your an iconoclast...serve some whites this fall...and look, feel, and live like a trendsetter. Go on with your bad self...and let those other folks live their boring, stright-jacket lives. Hudson Valley Wine Festival - My Mother-In-Law Loved It! On September 10th, myself, my wife Dominique, my two sons and my mother-in-law went to the New York Wine festival. I was a little dubious of bringing my mother-in-law, since she lives in France, and has very distinct, and very French views, on wine. It was a beautiful day. It was held at grieg Farm in Red Hook, New York. We ate crab and lobster roll, curried goat, and german sausages. And then we ended with some wonderful baked goods. Of course we drank some wonderful wine, and discovered some wonderful new labels and wines. It was a great day! And my mother-in-law even liked a number wines. What more could I ask for? White tents. Blue sky. Green lawn. Great wine. We had a ball. Several of my next few dispatches will be from the said event. If you missed it this year, then make sure to mark your calander for this next year. And if you want, bring your mother-in-law...she'll leave very happy.